I’ve recently become much more serious about my photography. There was a time, back in the 90’s, when I was very passionate about photography and traveled a great deal in pursuit of interesting subjects to shoot. I had a nice Minolta 35mm and a collection of lenses I traveled with. I developed a nice little portfolio and had sold a handful of prints. When it became apparent that film was on it’s way out I bought a DSLR setup and shelved my Minolta. Shooting digital was a transition I wasn’t ready for. I didn’t have the digital developing tools to process the images correctly. I got frustrated. I lost interest. I lost my passion. Over the last year or so I’ve sort of rediscovered my passion for photography. It’s been a slow process (but seemed to happen very fast) and is in no small part due to the inspiration I’ve gathered from other outdoor photographers like Jabon Eagar, Vernon Wiley and Bret Edge. The response to the images I’ve been producing lately has also urged me to fine tune and develop my eye and processing skills. Thanks to everyone who has encouraged me to keep shooting. I took my Nikon setup to Oregon with me in January while visiting my brother and his family. The weather turned incredibly cold during our visit and made for some really nice Winter images. Toward the end of the trip we took time to visit a small Elk Viewing Tour operation outside Baker, Oregon. I took shots of my brother’s kids, the snow covered valley and the horse-drawn carriage that took us down to the Elk. 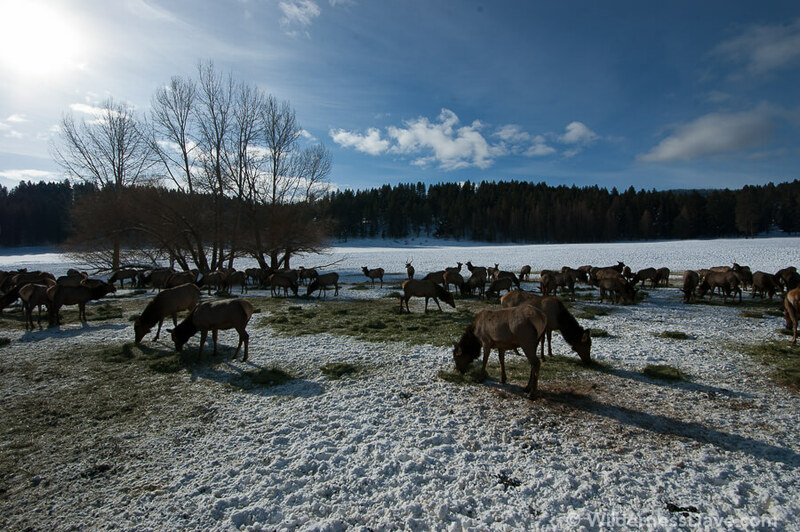 We were brought within 10-20 feet of a group of nearly 200 Elk feeding in the valley floor near a small creek. Unfortunately, all I had was my wide-angle lens so I missed the opportunity for any close-ups of the Elk. I took some shots but was not terribly happy with what I was getting. When I got back to the computer later in the evening to review the images, I just wasn’t happy with the Elk shots at all. The colors were bland, the Elk seemed far away and I wasn’t happy with the composition. They all can’t be winners, so I ignored them. Lately, at the suggestion of Bret Edge, I began using Adobe Lightroom to process my images. I’m pretty happy with the tools there and it’s encouraged me to go back and re-examine older images to see what I can do with them. I’ve had a lot of success reworking older shots (even JPGs) to coax more color and clarity from the images. Because of this, I decided to see if there was anything worth keeping from my Elk shots. I quickly realized that a big part of what bothered me about the above image was the composition. More than most, this shot needed to be cropped into more of a panoramic view. 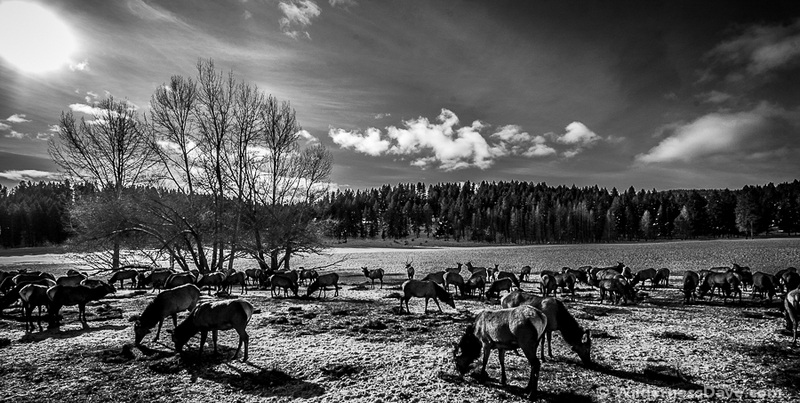 Using the basic rule of thirds, I cropped the image to make the Elk scene fill the bottom third of the image. Suddenly, the sky felt bigger and the wispy clouds seemed to have more character. Also, the boring trees to the right seemed to gain interest. The whole image, to me, began to feel balanced and I found myself wanting to make this one work. Looking at the new composition, I started to look for colors to accent. Where is my contrast? How do I create drama? The blue sky was nice, but there was nothing but the white snow and brown, dingy trees to offset it. Nothing I could enhance or develop. I began boosting the contrast and clarity, looking for something that would stand out. Then it hit me, there was enough heavy blacks and light sky and snow that this might be a good candidate for black-and-white. The lack of dramatic colors in the piece made that an easy choice. So I dropped the saturation out of everything and played with the highlights and shadows until I had a super crisp, heavy contrast black-and-white image. The sky retained it’s dramatic look, the tree now silhouetted nicely against the sky and the Elk scene took the role of the detailed foreground. I can’t decide if the dark ribbon of background evergreens that essentially splits the image in half helps, or hurts, the composition. Either way, I feel like this is now an image I don’t mind putting my name on. When I shot film, I enjoyed shooting in black-and-white and often trips with nothing but B/W film in my bag. I’m not sure why it took me so long to see the potential in this image, but I’m glad I took another look at it. What do you guys think? Thumbs up on this one, or should I have left it in the virtual trash can? This image was shot on a Nikon D70s with a Nikon Nikkor 10-28mm WA lens. Exp: 1/500, F/11, ISO-200, 10mm.